Amanda Walker recently achieved the Certified Patient Experience Professional (CPXP) designation. Walker currently serves as Senior Vice President of Patient Experience. With this certification, Walker joins an elite group of healthcare professionals committed to ensuring the best in experience for all they care for and serve. Walker becomes the first Certified Patient Experience Professional in the Specialty Pharmacy industry. The certification, awarded by Patient Experience Institute (PXI), signifies that recipients possess the qualities of a leader who influences the systems, processes, and behaviors that cultivate consistently positive experiences with knowledge and practical experience necessary to pass a rigorous examination. In addition, achievement of certification highlights a commitment to the profession and to maintaining current skills and knowledge in supporting and expanding the field of patient experience. Once certified, a CPXP must maintain his or her certification every three years and remain active in the field. Development of the exam followed a rigorous and standardized process, engaging the voices of over 1000 members of the patient experience community globally. The process adhered to the Standards for Education and Psychological Testing (AERA, APA, & NCME, 2014) and Standards for the Accreditation of Certification Programs (NCCA, 2014). 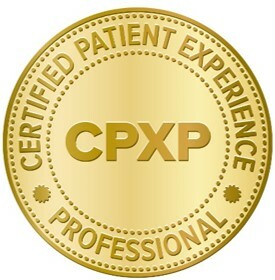 CPXP certification is an international designation intended for healthcare professionals or other individuals with a commitment and interest in patient experience improvement. Applicants should have professional experience in a patient experience related role or experience in engaging in patient experience efforts from various perspectives, be they as a healthcare professional, consultant or patient and family member committed to experience excellence. Heritage Biologics is a leading Specialty and Home Infusion Pharmacy focused on redesigning the traditional pharmacy service model. By creating the first formal Pharmacy Patient Experience (RXPX) program in the nation, Heritage has defined the new standard for rare care. This important collaborative program aims to advance the traditional hospital Patient Experience (PX) program into the outpatient pharmacy setting. Specialty Pharmacies play an integral role in the overall healthcare model. The pharmacy is the link between the healthcare provider and the patient. As the healthcare market evolves, continuity of care will become increasingly critical across the healthcare spectrum. Transitioning patients to outpatient care will be a key driver, and monitoring that part of the puzzle is becoming a priority for all stakeholders. Heritage Biologics is changing healthcare! For more information, please visit http://www.HeritageBiologics.com, or contact us at rarecare(at)heritagebiologics.com or (855) WE-R-RARE.